Planning a hen party is a big deal! It’s your chance to celebrate your own upcoming wedding or to wish your best friend well in their nuptials. And what better way to celebrate with your friends than to book a weekend in one of our hen party cottages? Holt Farm is a collection of four luxury hen party cottages where we regularly welcome groups of girls for weekends of fun, relaxation and celebration. The countryside location offers you your own private slice of heaven; book all four cottages and you and 21 friends can enjoy a weekend with no noise restrictions and your own private courtyard, hot tubs and 22 person dining hall. Gather your nearest and dearest and head off to the Herefordshire countryside for a weekend to remember at Holt Farm’s hen party cottages. Book any of the cottages or a combination to suit your group size. The cottages all have the facilities for self-catering, or head out in the local area for some delicious restaurants and to enjoy the culinary delights of the region. 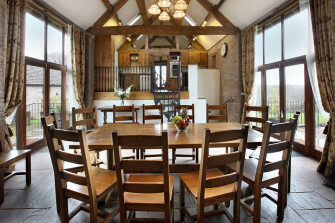 Why Choose Holt Farm for Your Hen Party Cottage? Holt Farm is located in Michaelchurch Escley, just outside of Hay On Wye in Herefordshire. The location makes it really easy to reach from all around the UK, with easy access from London, Bristol, Cardiff, Birmingham, Liverpool and Manchester. Gather the girls together in a place that’s accessible for all! Planning a wedding can be incredibly stressful. Help the bride-to-be relax with a stay in these gorgeous luxury hen party cottages. 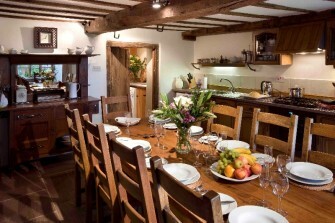 Holt Farm has received the Visit England 4 Star Gold Award, so you know your weekend’s in good hands with us. The cottages are all appointed to a very high standard and you can enjoy king sized beds, underfloor heating, en suite bathrooms, wet rooms, log burning fires, large social spaces and more. Sit back, relax and enjoy your weekend. When you book all of the Holt Farm cottages together, you’re getting exclusive, private use of the whole site – making it the ideal place to let you hair down and party! 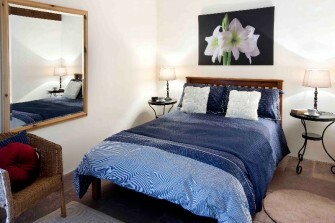 There are no volume restrictions when you rent the whole site and the properties combined accommodate up to 22 people. There is even a dining hall big enough for all 22 guests to dine together and swap stories about the bride-to-be, discuss wedding plans and practice their wedding speeches. Of course, no hen party is complete without some fun activities for the bride to be and her group. Previous hen guests have loved the Hereford Spa for a sumptuously pamper-filled day. More active hens enjoy the local activities, including archery, clay bird shooting, quad biking, rock climbing, pony trekking and more. Take a look at nearby Mountain Mayhem‘s hen party deals. For a more relaxed outdoor activity, enjoy the two Holt Farm outdoor Hot Tubs and the Herefordshire countryside offers some beautiful walks. And who can resist a country pub? Of course, there are plenty of other reasons to book Holt Farm’s hen party cottages; browse the Our Cottages page to find out more or give us a call on 01981 510238 if you’d like to chat with one of our team about your hen party booking. Booking your hen party cottage needn’t be stressful. Our simple online booking form allows you to see quickly and easily when the cottages are available and to book them for your group. We’re also here on the other end of the phone should you wish to speak to us – we’ve been helping people to plan their hen parties for years and would be more than happy to help you too. Use our online contact form and we’ll call or email you back, or give us a call on 01981 510238. 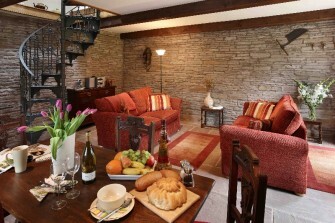 “We had a fantastic time using three of the cottages. 15 ladies, many bottles of wine, streams of bunting and lots of pictures. “We were able to have a fantastic walk to the local pub (The Bridge Inn), great cider (7,5% is incredibly strong). Followed by wedding dress, cocktail party, murder mystery and ‘Mr and Mrs’.